A new name on the wheel building scene from two men with plenty of history in the sport, the Walker Brothers Fleet wheelset seems like a great all-round upgrade option. 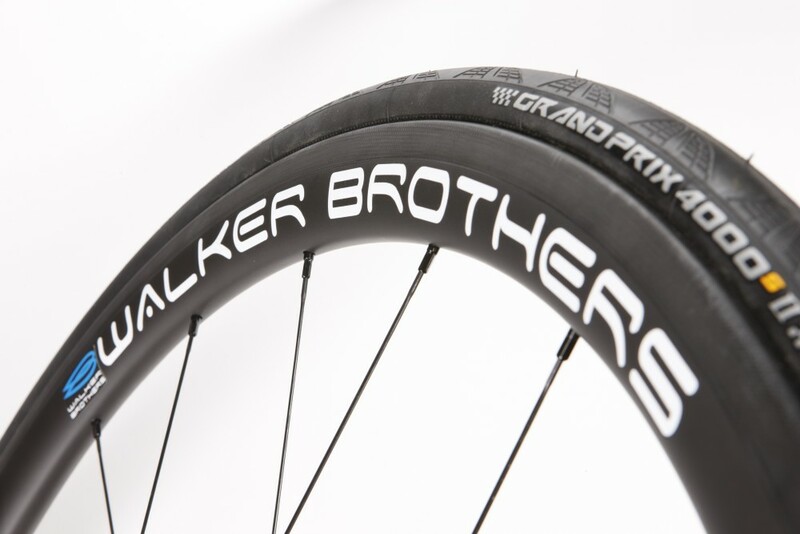 The Walker Brothers Fleet wheelset is one of the first sets of hoops to come from a new company that is seeking to find a place for itself in the highly competitive aftermarket for carbon wheels. Available as both clinchers and tubulars, in 40mm, 56mm, and 80mm depths, we’ve been testing the 40mm clincher version, likely to be the best-selling model in the range. Walker Brothers is a new brand set up by Brian and Harry Walker, two men who enjoyed lengthy stays at the top of the British time trialling scene in the 1990s, often competing on custom bikes with accessories that they made themselves. Now the pair have joined forces to create a range of wheels, all of which are made to order in the Walker Brothers’ Newcastle workshop. The 40mm option seems to be a good option for all sorts of riding, and we had a good few weeks of testing these wheels over country lanes that hadn’t held up too well to the winter weather and found them to be just as at home on these less-than-welcoming surfaces as they were on smoother A-roads cruising in and out of south London. Exactly the sort of sturdiness we’d hope for in any product heralding from the north of England. However, you don’t splash out 800 quid in pursuit of sturdiness! What you really want to know is “are they fast?” and, as they come with a carbon braking surface, “do they stop?” The answer to both is yes. The most notable thing to say about the Walker Brothers Fleet wheelset is their whopping, and bang up-to-date, 27.2mm width. In fact these wheels were so wide that we had to fully loosen off our brakes in order to fit the rim. With the current trend towards wider and wider tyres, the Fleets certainly seem future proof, and the 25mm Continental GP4000S tyres we ran on them fitted flush against the rim. The Fleets are laced with Sapim CX-Ray spokes, a good choice for a mid-level wheelset, with 20 at the front and 24 at the rear making for a stiff wheelset that responded promptly to accelerations, rarely brushing against our brake pads even with the minimal clearance we were forced to run. At just over 1500g for the pair (excluding skewers) these certainly aren’t the lightest carbon clinchers on the market, and if you’re after a specialist wheelset for hilly races or mountainous sportives then there are better wheels out there, but we found them to be solid performers in the hills, and certainly didn’t slow us down. Testing the Walker Brothers Fleet wheelset in the final throes of winter gave us plenty of opportunities to put them through their paces in windy conditions. The wide rim profile meant that these wheels performed fairly well in most conditions, although we felt they lacked a little stability in strong crosswinds. This is always going to be a problem area for deep-section wheels, but although we didn’t experience any drama when riding these wheels in crosswinds, we found ourselves having to concentrate a little more than we would have liked. In essence these wheels felt more like 60mm deep rims in these conditions. If these wheels didn’t always inspire confidence in crosswinds, the same cannot be said about the braking performance. Carbon braking surfaces are not always renowned as superb stoppers, and when your first ride on a pair of carbon clinchers is a wet one, as ours was with the Fleets, the first attempt at sharp braking can be a nervous experience. Thankfully the basalt braking surface on the Walker Brothers Fleet wheelset more than met expectations. The braking performance was excellent in both wet and dry conditions, with consistent stopping power and no “grabbing” at the braking surface, all performed without so much as a squeak. Sharp braking isn’t quite as good as with aluminium braking tracks, but we couldn’t expect too much more from a wheelset of this price. Talking of price, the cost of £799 for the pair (excluding skewers) seems pretty much spot-on for a pair of mid-level carbon clinchers. 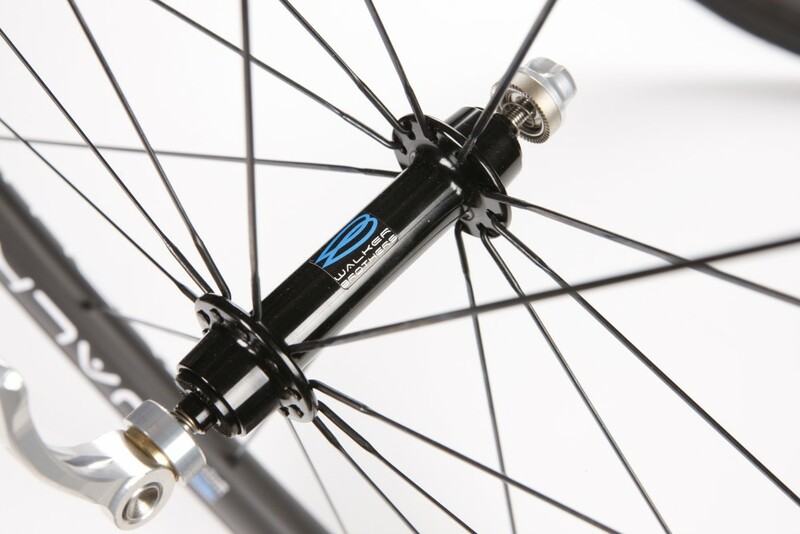 The matt black finish, which can be complemented with either white or black Walker Brothers decals, also looks great, making for a wheelset that more than matches its price point in both performance and looks. For more details visit the Walker Brothers website. 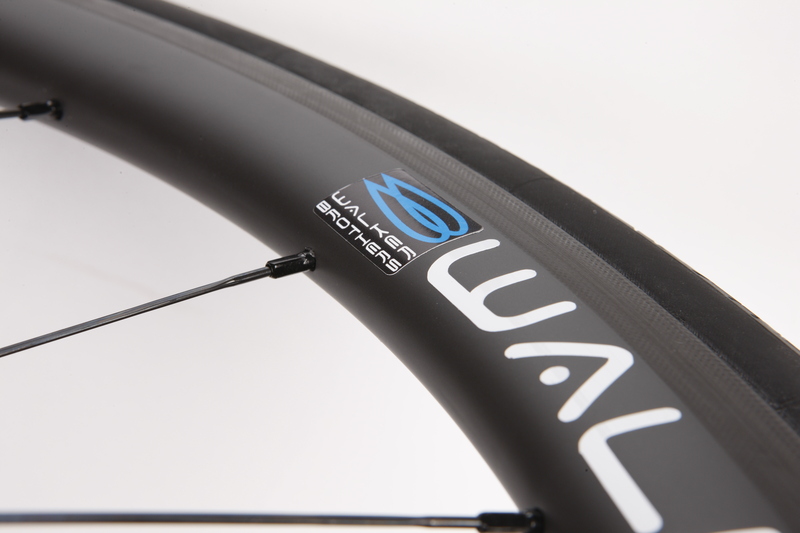 The Walker Brothers Fleet wheelset is a good option for anyone looking for a set of mid-level carbon clinchers that will prove to be good all-rounders for both racing and training. Braking performance is superb, as is acceleration, although control in crosswinds could be improved.